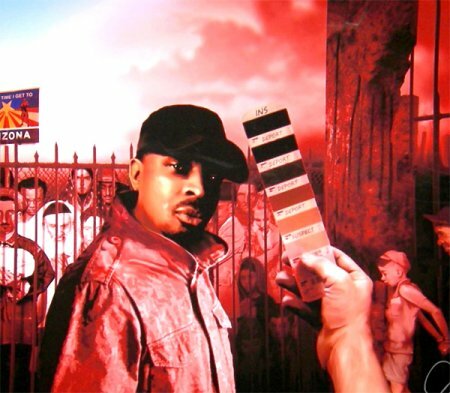 Personally, I’m a big fan of the Arizona immigration law, but there are probably a few people reading who aren’t and if that’s the case, you might like one of Chuck D.’s paintings. Apparently, there are only going to be 300 made. All that being said, I was listening to Public Enemy back in college, when they first came on the music scene. I thought it would be fun to interview someone on the other side of the spectrum for once. So, on Monday we got together for an interview. What follows is a transcript of our conversation, edited slightly for grammar and readability’s sake. First question: Air America had a lot of money behind it, it had a lot of talent involved, and it received a lot of free publicity. You were on the air there; so why do you think ultimately it didn’t succeed? I don’t think they had a lot of affiliates that moved up and collaborated with its mission. I think it was kind of like a lone wolf where you guys…sometimes you see guys like Rush Limbaugh — they have a lot of people who are in the established situations who are in tandem with each other. They might not be with each other but, you can always look at a guy like Rush Limbaugh. How many stations does he have? Oh gosh, hundreds and hundreds. There you go. And Air America never had that. They had maybe a good 40 or 50 stations. It’s just a revolving process and I don’t think they got to that point but look, they had some people come off of there that ended up being senators and Rachel Maddow. Yes, they had some successful people on there. I had a great time there all the way from the beginning to the end. I don’t even understand why they say “conservative.” Explain to a black man what a conservative is? People who believe in free markets, limited government, traditional values, that sort of thing. OK, and the United States of America. Yes, well, a conservative is different if you go different places. A conservative in Iran could be a really, really bad guy. Yes, I know that’s what I’m saying. I deal with about 70 countries; so in all due respect, I have to ask you for the definition so I know where I’m coming from. Well, you are a world-wide man. You’re everywhere. But there are some conservatives here in the states, myself included, who like your music. I know Dana Loesch — I’ve seen her wearing a Public Enemy t-shirt. I know some musicians don’t like that. Linda Ronstadt, for example, said, “If I go to a concert and find out someone in the audience is a Republican, it can cloud my enjoyment.” How do you feel about having conservatives and Republicans liking your music? I think people are people and human beings are human beings. I look at myself as being a citizen of the world and I think art and music bring human beings together, John. But, I also think governments have always had a historical tendency to split people up, categorize them, and put them in compartments. So, I’m not really for that as much as I’m for the beauty of music and culture. You are, or at least you used to be, a fan of Louis Farrakhan and the Nation of Islam. Does it bother you that they’re an anti-Semitic organization and that they don’t like white people? Oh, oh, no. That’s totally untrue because I think when you hear Mr. Farrakhan speak, he’s very clear about what they don’t like. And I think what they do not like is they don’t like misinformation in the media. They’ve been speaking like that for years; so I think what Americans are used to is a media giving them broad strokes instead of clarity. That’s why I’ve listened to them for a long time. Besides the fact that being somebody who’s black and able to relate to where he’s coming from and so, that’s where I’m coming from. I mean, when you start to talk about anti-this, anti-religion, and stuff like that, I don’t think the Nation of Islam has been talking about that at all. I think it was talking about how certain situations might be anti-poor people, anti-black, anti-Christian stuff like that; so when you get into that type of conversation, anything can be misconstrued and I think that’s a prime example. No, that was something that was coming out of the 1940s and the 50s. It was a rebuttal against how white America treated black people and other people’s color. So they don’t believe that anymore? No, but at the same time let’s look back in the 1950s and 40s…. So that’s the whole thing. The devil came out of deeds of evil. And so Elijah Muhammad said you know what, the so called white man, because the white man claimed that he was a white man, he didn’t claim that, you know, it was black people that said, “Oh, that’s the white man.” No, white people made the distinct difference, especially in North Carolina, made a distinct difference in like, “That’s black and we’re white.” So this is created by, you know, a white western establishment. But anyway in the 40s and the 50s, the Nation of Islam used to have this thing called the white man is basically doing deeds of evil. If he was to hold up a mirror, and look at himself and look at his background in America, he would see a whole bunch of one sided deeds of evil. That’s where all that thing came from, this whole thing about devils. I’m saying that was in the middle of the folklore about the thing. But in the midst of the 40s and the 50s the rhetoric that was going around against black people…. Yes, and this was the antidote. I guess to say, “Look, believe in yourself. You’re beautiful. You’re not ugly. Yes, understand that you’re the original man. They claim that they’re original and you’re corrupted with your existence. It’s the other way around. The black man is Jesus.” There are a whole bunch of things that can be argued, but it gave black people some strength in the blizzard of hate. I think that was the message. Even to this day, right now, human beings are human beings, John. And I think that the conversation for black people being human beings was always rejected for such a long period of time that a whole another initiative had to evolve in order for people to be projected. And you know, here we are. Here we are as a world, people, where do we stand? Are we going to be based by what Dr. King said, you know….. he wanted his children to be recognized by their character and their insides, instead of the outside. I just think that a lot of the human beings, a lot of Americans — black, white, or whatever — there’s a whole lot of emphasis on the outside of people instead of the insides of them. I think that needs to be worked on. I think the outside of people is a little bit overrated, John. I noticed that in testimony before Congress, you weren’t much of a fan of the RIAA. Do you think people should be able to download your music and the music of other artists for free if they like? You know, the Internet – I think it’s like radio. I mean usually when people download music, John, it’s usually such a poor quality that if they want to gravitate to the higher quality of sound, they can buy into it from sites that are able to give a wider file. So, to get the best quality, I think, is something you should pay for. I mean you always could tape off the radio for free, but people want the best quality. So my conversation in the beginning of the century was, Hey, this thing is better than radio because radio is corrupted and it collaborates to actually squeeze many artists off of it. So, that was my argument then. Last question: Let’s say that Arizona, the rest of the states, and the federal government were to stop enforcing immigration law and allow everyone who came here illegally to become a citizen. Well, since our border isn’t secure, and since that’s going to look pretty good to a lot of people, we’d have millions of other people continuing to pour across the borders. Would we make them citizens, too, deport them, or how would that work? Well, look, I’m a purist. If you want to go back to the root, this is these people’s land in the first place. When does government start and when does it finish? I think the whole world is just lopsided, you know, how the United States thinks. I think there is a severe displacement of human beings on this planet. I think Canada could use 100 million more people. But they’ve got borderline policies that said they won’t allow people to come in, even with the polar caps melting, giving them all the fresh water in the world, and oil underneath their ground. You’ve got a government that’s kind of like a break-off from England that just goes over to another part of the hemisphere and said, “We claim this.” I think that’s a little barbaric. So, I could be looked upon, as they say, “You know Chuck, he’s just crazy because he just believes in music and culture trying to fix the world.” But I would tell you that governments and culture are diametrically opposed. I mean, you could say liberal and conservative, they’re the same thing — and, yes, there is a need for government, but don’t need me to tell you that. I pointed towards Arizona when I did “By the Time I Get to Arizona” about the MLK policy years ago. When the holiday came in, they said that song is obsolete. But last year I did “Tear Down That Wall.” How could Mr. Reagan tell Mr. Gorbachev to tear down that wall in Europe and there be a $1 billion wall between the United States and Mexico? I’m asking you, Mr. Hawkins, and I’m saying that Texas, New Mexico, Arizona and California, right — they’ve been established no more than 200 years. And you talk about 1000, 2000 years of people going back and forth there. So basically, people should be able to go back and forth? It should be open borders? I think people should go anywhere in the world that they choose to. But then, it’s easy for somebody to say I’m crazy. How are you going to be able to organize that? How are you going to be able to enforce that? I don’t know. I’m not a person that runs the government. Chuck, I really appreciate your time. Thanks a lot. Once again, you can get Chuck D.’s new artwork here.